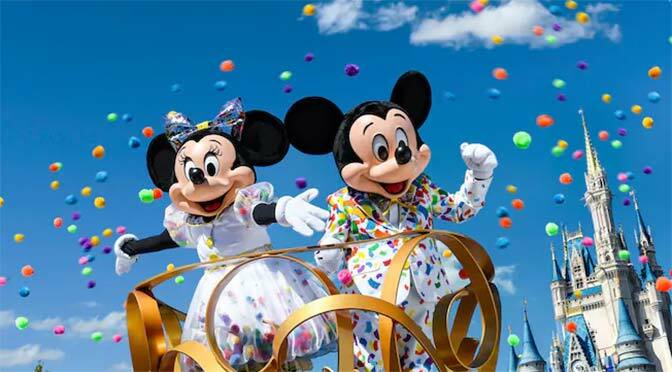 As a part of Mickey and Minnie’s surprise celebration, which begins January 18, 2019 and runs through September, a few changes will occur with the character lineup. Here’s the details. Minnie will begin meeting with Mickey in Town Square Theater. Each will show off their new celebration costumes. If you have a Fastpass to meet Mickey in Town Square, you’ll also meet Minnie as they will appear for the same photo. Pluto will move to Pete’s Silly Sideshow. Pluto will take Minnie’s place inside the Silly Sideshow. Chip n Dale are said to no longer offer a standard meet and greet in the Magic Kingdom after January 18, but will appear 3 times daily in the Move It, Shake It, MousekeDance It Street Party. They will still meet in their other locations. The Magic Kingdom flagpole area is said to begin hosting random appearances by various Disney characters. Disney has not, and likely will not, release who is appearing on a given day. I’d say that the Chat Room on Character Locator will be the best place to keep track of who is appearing at the flagpole daily through September. If the random characters are some great, rare characters, you should expect long lines. If they are just shuffling the standard characters through the space, the lines will the be typical 15-20 minute waits that the flagpole experiences. Are you excited for the changes? Share the post with your friends by using the share buttons below! I wish the cast members would’ve just relocated Chip & Dale at the Magic Kingdom for standard meets and greets, like Frontierland, Tomorrowland, or maybe Pete’s Silly Side Show. We’ll still be able to meet Chip & Dale at Hollywood Studios or Animal Kingdom, but pretty disappointing to me that Chip & Dale will not be doing standard meets and greets at the Magic Kingdom. I hope they will return to the Magic Kingdom after Mickey & Minnie’s 90th celebration. I will enjoy my WDW trip in late April, but the Magic Kingdom is not perfect without Chip & Dale meets and greets. Is Minnie going to talk? I’m British and don’t understand a lot of American terminology. What does ‘runs through September’ mean? Is it the end of August? The end of September? Thanks. I’m excited about Minnie joining Mickey! Not to sound silly but by “through Sept” does that mean the whole month of September? I hope so, we are headed down the 3rd week and hopefully she is still meeting with Mickey! Very very excited! I wish to see Pinocchio on Main Street again when I return to Orlando.